This started out as a Wordless Wednesday post. But I decided there was just too much to be said about these pictures. You may recognize the subject: Marshall’s kitty, Snugg. He’s been the star of some of my previous posts. A cat (who’s a camera hog) impersonating a bird. Good thing that’s a LARGE bird bath. This entry was posted in Family and tagged cat in bird bath. Bookmark the permalink. That is too funny and too cute, Dianna. 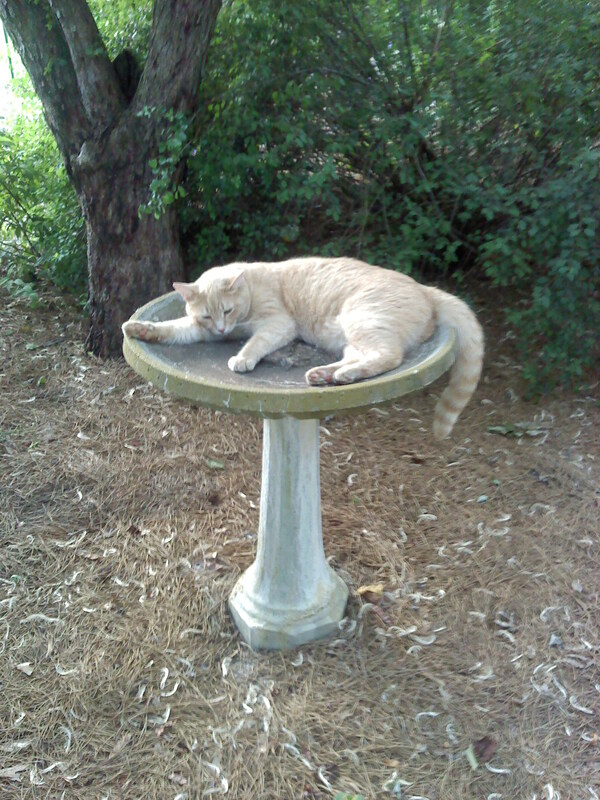 Snugg might as well use the bird bath as a good napping spot since it’s bone dry…he’s such a camera hog! Intrigued to see use such a term as a cat-bird. As you think of this term, what aspects of the situation jump out at you? In our area, there’s a species of bird known as a catbird. The title of my post today is a play on words, since there are pictures of a cat in a birdbath. Fun pictures, fun post: not looking to overthink it. Dying laughing! I mean that is one content kitty.. 😆 What is it about those ginger and taffy boy kitties? They are so laid back. Life is Good for Snugg! THAT is so comical! I love it — a catbird! Good photos, Marshall!! he’s just beautiful – and living the good life! Is he waiting for a bath or a bird? The vet said he needs to go on a diet; lose about 3 pounds … That was a few weeks ago, though, so the number’s probably gone up! I think he’s “throwing his weight around” – he’s claimed that spot ! Thanks for featuring him again! I’m pretty sure I have never seen a cat in a bird feeder before. Too funny, but he’s so cute! Love this! But you didn’t link your cat-bird to WBW! Silly kitty. As long as he is comfortable that is all that matters. Just wanted to say thanks for stopping by my blog today. Cute picture of Snugg in the bird bath. I love your play on words. Good job as always. Snugg knows where the action is! This is a fun post Dianna. I had a local friend who used the word cat-bird in a kind of teasing way to talk about people who were clever or funny “He’s a cat-bird,” she would say, with a grin. My mom used to say that, too, Dor! I thought of her when I wrote the post! 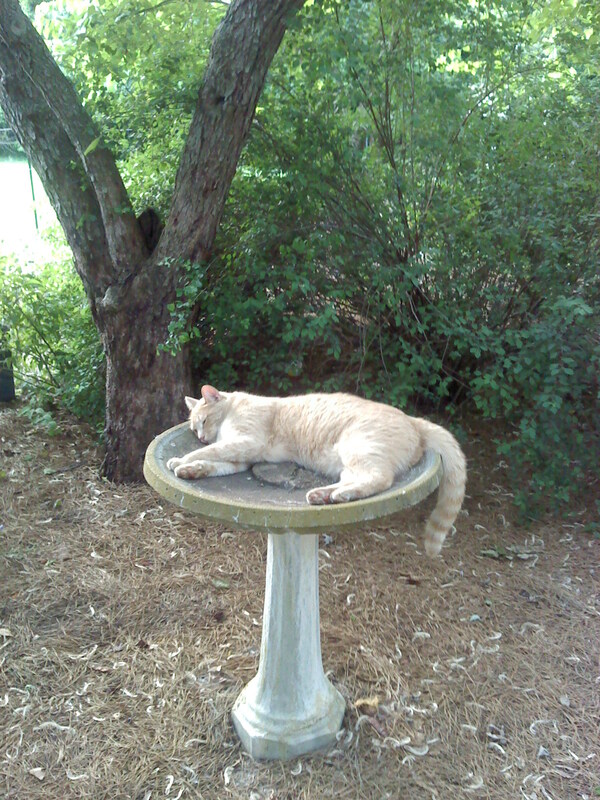 Snugg is a big load for a bird bath but I know why he’s plopped up there for a nap – it’s COOL on a hot day. 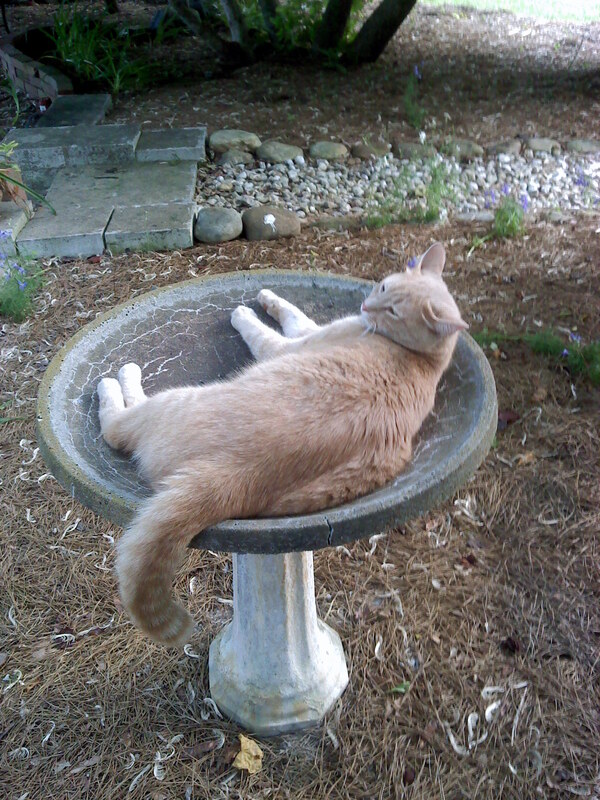 The concrete is cooler than the air – my darling cat Ricky LOVED to lie in the bird bath – even if it had water in it!